The real use of FS recreation access fees is exposed. The Forest Service and other land management agencies are charging more and more access fees. They say the money is put to work for underfunded recreation programs, but it is now apparent that they actually using the money for other purposes including closing recreational facilities. Bill Schneider exposes them in New West. Now We Know Where the RAT Goes. By Bill Schneider. Note that the law on which this was passed by Congress without any debate. SEC. 801. SHORT TITLE AND TABLE OF CONTENTS. (a) Short Title- This title may be cited as the `Federal Lands Recreation Enhancement Act’. Sec. 803. Recreation fee authority. Sec. 807. Special account and distribution of fees and revenues. Sec. 812. Enforcement and protection of receipts. Sec. 813. Repeal of superseded admission and use fee authorities. Sec. 814. Relation to other laws and fee collection authorities. Sec. 815. Limitation on use of fees for employee bonuses. (1) STANDARD AMENITY RECREATION FEE- The term `standard amenity recreation fee’ means the recreation fee authorized by section 3(f). (2) EXPANDED AMENITY RECREATION FEE- The term `expanded amenity recreation fee’ means the recreation fee authorized by section 3(g). 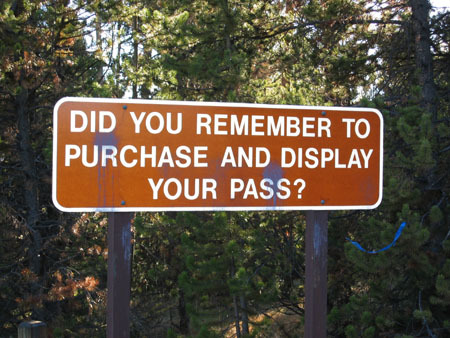 (3) ENTRANCE FEE- The term `entrance fee’ means the recreation fee authorized to be charged to enter onto lands managed by the National Park Service or the United States Fish and Wildlife Service. (4) FEDERAL LAND MANAGEMENT AGENCY- The term `Federal land management agency’ means the National Park Service, the United States Fish and Wildlife Service, the Bureau of Land Management, the Bureau of Reclamation, or the Forest Service. (5) FEDERAL RECREATIONAL LANDS AND WATERS- The term `Federal recreational lands and waters’ means lands or waters managed by a Federal land management agency. (6) NATIONAL PARKS AND FEDERAL RECREATIONAL LANDS PASS- The term `National Parks and Federal Recreational Lands Pass’ means the interagency national pass authorized by section 5. (7) PASSHOLDER- The term `passholder’ means the person who is issued a recreation pass. (8) RECREATION FEE- The term `recreation fee’ means an entrance fee, standard amenity recreation fee, expanded amenity recreation fee, or special recreation permit fee. (9) RECREATION PASS- The term `recreation pass’ means the National Parks and Federal Recreational Lands Pass or one of the other recreation passes available as authorized by section 5. (B) the Secretary of Agriculture, with respect to the Forest Service. (11) SECRETARIES- The term `Secretaries’ means the Secretary of the Interior and the Secretary of Agriculture acting jointly. (12) SPECIAL ACCOUNT- The term `special account’ means the special account established in the Treasury under section 7 for a Federal land management agency. (13) SPECIAL RECREATION PERMIT FEE- The term `special recreation permit fee’ means the fee authorized by section 3(h). (a) Authority of Secretary- Beginning in fiscal year 2005 and thereafter, the Secretary may establish, modify, charge, and collect recreation fees at Federal recreational lands and waters as provided for in this section. (1) The amount of the recreation fee shall be commensurate with the benefits and services provided to the visitor. (2) The Secretary shall consider the aggregate effect of recreation fees on recreation users and recreation service providers. (3) The Secretary shall consider comparable fees charged elsewhere and by other public agencies and by nearby private sector operators. (4) The Secretary shall consider the public policy or management objectives served by the recreation fee. (5) The Secretary shall obtain input from the appropriate Recreation Resource Advisory Committee, as provided in section 4(d). (6) The Secretary shall consider such other factors or criteria as determined appropriate by the Secretary. (c) Special Considerations- The Secretary shall establish the minimum number of recreation fees and shall avoid the collection of multiple or layered recreation fees for similar uses, activities, or programs. (B) For general access unless specifically authorized under this section. (C) For dispersed areas with low or no investment unless specifically authorized under this section. (D) For persons who are driving through, walking through, boating through, horseback riding through, or hiking through Federal recreational lands and waters without using the facilities and services. (E) For camping at undeveloped sites that do not provide a minimum number of facilities and services as described in subsection (g)(2)(A). (F) For use of overlooks or scenic pullouts. (G) For travel by private, noncommercial vehicle over any national parkway or any road or highway established as a part of the Federal-aid System, as defined in section 101 of title 23, United States Code, which is commonly used by the public as a means of travel between two places either or both of which are outside any unit or area at which recreation fees are charged under this Act. (H) For travel by private, noncommercial vehicle, boat, or aircraft over any road or highway, waterway, or airway to any land in which such person has any property right if such land is within any unit or area at which recreation fees are charged under this Act. (I) For any person who has a right of access for hunting or fishing privileges under a specific provision of law or treaty. (J) For any person who is engaged in the conduct of official Federal, State, Tribal, or local government business. (K) For special attention or extra services necessary to meet the needs of the disabled. (2) RELATION TO FEES FOR USE OF HIGHWAYS OR ROADS- An entity that pays a special recreation permit fee or similar permit fee shall not be subject to a road cost-sharing fee or a fee for the use of highways or roads that are open to private, noncommercial use within the boundaries of any Federal recreational lands or waters, as authorized under section 6 of Public Law 88-657 (16 U.S.C. 537; commonly known as the Forest Roads and Trails Act). (A) Any person under 16 years of age. (B) Outings conducted for noncommercial educational purposes by schools or bona fide academic institutions. (C) The U.S.S. Arizona Memorial, Independence National Historical Park, any unit of the National Park System within the District of Columbia, or Arlington House-Robert E. Lee National Memorial. (D) The Flight 93 National Memorial. (E) Entrance on other routes into the Great Smoky Mountains National Park or any part thereof unless fees are charged for entrance into that park on main highways and thoroughfares. (F) Entrance on units of the National Park System containing deed restrictions on charging fees. (G) An area or unit covered under section 203 of the Alaska National Interest Lands Conservation Act (Public Law 96-487; 16 U.S.C. 410hh-2), with the exception of Denali National Park and Preserve. (H) A unit of the National Wildlife Refuge System created, expanded, or modified by the Alaska National Interest Lands Conservation Act (Public Law 96-487). (I) Any person who visits a unit or area under the jurisdiction of the United States Fish and Wildlife Service and who has been issued a valid migratory bird hunting and conservation stamp issued under section 2 of the Act of March 16, 1934 (16 U.S.C. 718b; commonly known as the Duck Stamp Act). (J) Any person engaged in a nonrecreational activity authorized under a valid permit issued under any other Act, including a valid grazing permit. (4) NO RESTRICTION ON RECREATION OPPORTUNITIES- Nothing in this Act shall limit the use of recreation opportunities only to areas designated for collection of recreation fees. (1) AUTHORIZED SITES FOR ENTRANCE FEES- The Secretary of the Interior may charge an entrance fee for a unit of the National Park System, including a national monument administered by the National Park Service, or for a unit of the National Wildlife Refuge System. (2) PROHIBITED SITES- The Secretary shall not charge an entrance fee for Federal recreational lands and waters managed by the Bureau of Land Management, the Bureau of Reclamation, or the Forest Service. (1) A National Conservation Area. (2) A National Volcanic Monument. (3) A destination visitor or interpretive center that provides a broad range of interpretive services, programs, and media. (ii) A permanent toilet facility. (iii) A permanent trash receptacle. (iv) Interpretive sign, exhibit, or kiosk. (1) NPS AND USFWS AUTHORITY- Except as limited by subsection (d), the Secretary of the Interior may charge an expanded amenity recreation fee, either in addition to an entrance fee or by itself, at Federal recreational lands and waters under the jurisdiction of the National Park Service or the United States Fish and Wildlife Service when the Secretary of the Interior determines that the visitor uses a specific or specialized facility, equipment, or service. (i) Tent or trailer spaces. (v) The collection of the fee by an employee or agent of the Federal land management agency. (ix) Simple devices for containing a campfire. (B) Use of highly developed boat launches with specialized facilities or services such as mechanical or hydraulic boat lifts or facilities, multi-lane paved ramps, paved parking, restrooms and other improvements such as boarding floats, loading ramps, or fish cleaning stations. (C) Rental of cabins, boats, stock animals, lookouts, historic structures, group day-use or overnight sites, audio tour devices, portable sanitation devices, binoculars or other equipment. (D) Use of hookups for electricity, cable, or sewer. (E) Use of sanitary dump stations. (F) Participation in an enhanced interpretive program or special tour. (G) Use of reservation services. (H) Use of transportation services. (I) Use of areas where emergency medical or first-aid services are administered from facilities staffed by public employees or employees under a contract or reciprocal agreement with the Federal Government. (i) Bathhouse with showers and flush toilets. (vi) Floats encompassing the swimming area. (h) Special Recreation Permit Fee- The Secretary may issue a special recreation permit, and charge a special recreation permit fee in connection with the issuance of the permit, for specialized recreation uses of Federal recreational lands and waters, such as group activities, recreation events, motorized recreational vehicle use. (a) In General- As required in this section, the Secretary shall provide the public with opportunities to participate in the development of or changing of a recreation fee established under this Act. (b) Advance Notice- The Secretary shall publish a notice in the Federal Register of the establishment of a new recreation fee area for each agency 6 months before establishment. The Secretary shall publish notice of a new recreation fee or a change to an existing recreation fee established under this Act in local newspapers and publications located near the site at which the recreation fee would be established or changed. (3) publishing the guidelines in paragraphs (1) and (2) in the Federal Register. (A) AUTHORITY TO ESTABLISH- Except as provided in subparagraphs (C) and (D), the Secretary or the Secretaries shall establish a Recreation Resource Advisory Committee in each State or region for Federal recreational lands and waters managed by the Forest Service or the Bureau of Land Management to perform the duties described in paragraph (2). (B) NUMBER OF COMMITTEES- The Secretary may have as many additional Recreation Resource Advisory Committees in a State or region as the Secretary considers necessary for the effective operation of this Act. (C) EXCEPTION- The Secretary shall not establish a Recreation Resource Advisory Committee in a State if the Secretary determines, in consultation with the Governor of the State, that sufficient interest does not exist to ensure that participation on the Committee is balanced in terms of the points of view represented and the functions to be performed. (D) USE OF OTHER ENTITIES- In lieu of establishing a Recreation Resource Advisory Committee under subparagraph (A), the Secretary may use a Resource Advisory Committee established pursuant to another provision of law and in accordance with that law or a recreation fee advisory board otherwise established by the Secretary to perform the duties specified in paragraph (2). (C) the expansion or limitation of the recreation fee program. (3) MEETINGS- A Recreation Resource Advisory Committee shall meet at least annually, but may, at the discretion of the Secretary, meet as often as needed to deal with citizen concerns about the recreation fee program in a timely manner. (4) NOTICE OF REJECTION- If the Secretary rejects the recommendation of a Recreation Resource Advisory Committee, the Secretary shall issue a notice that identifies the reasons for rejecting the recommendation to the Committee on Resources of the House of Representatives and the Committee on Energy and Natural Resources of the Senate not later than 30 days before the Secretary implements a decision pertaining to that recommendation. (A) NUMBER- A Recreation Resource Advisory Committee shall be comprised of 11 members. (B) NOMINATIONS- The Governor and the designated county official from each county in the relevant State or Region may submit a list of nominations in the categories described under subparagraph (D). (C) APPOINTMENT- The Secretary may appoint members of the Recreation Resource Advisory Committee from the list as provided in subparagraph (B). (I) Winter motorized recreation, such as snowmobiling. (II) Winter non-motorized recreation, such as snowshoeing, cross country and down hill skiing, and snowboarding. (III) Summer motorized recreation, such as motorcycles, boaters, and off-highway vehicles. (IV) Summer nonmotorized recreation, such as backpacking, horseback riding, mountain biking, canoeing, and rafting. (I) Motorized outfitters and guides. (II) Non-motorized outfitters and guides. (I) State tourism official to represent the State. (II) A person who represents affected Indian tribes. (III) A person who represents affected local government interests. (A) LENGTH OF TERM- The Secretary shall appoint the members of a Recreation Resource Advisory Committee for staggered terms of 2 and 3 years beginning on the date that the members are first appointed. The Secretary may reappoint members to subsequent 2- or 3-year terms. (B) EFFECT OF VACANCY- The Secretary shall make appointments to fill a vacancy on a Recreation Resource Advisory Committee as soon as practicable after the vacancy has occurred. (C) EFFECT OF UNEXPECTED VACANCY- Where an unexpected vacancy occurs, the Governor and the designated county officials from each county in the relevant State shall provide the Secretary with a list of nominations in the relevant category, as described under paragraph (5)(D), not later than two months after notification of the vacancy. To the extent possible, a vacancy shall be filled in the same category and term in which the original appointment was made. (7) CHAIRPERSON- The chairperson of a Recreation Resource Advisory Committee shall be selected by the majority vote of the members of the Committee. (8) QUORUM- Eight members shall constitute a quorum. A quorum must be present to constitute an official meeting of a Recreation Resource Advisory Committee. (9) APPROVAL PROCEDURES- A Recreation Resource Advisory Committee shall establish procedures for making recommendations to the Secretary. A recommendation may be submitted to the Secretary only if the recommendation is approved by a majority of the members of the Committee from each of the categories specified in paragraph (5)(D) and general public support for the recommendation is documented. (10) COMPENSATION- Members of the Recreation Resource Advisory Committee shall not receive any compensation. (A) NOTICE OF MEETINGS- All meetings of a Recreation Resource Advisory Committee shall be announced at least one week in advance in a local newspaper of record and the Federal Register, and shall be open to the public. (B) RECORDS- A Recreation Resource Advisory Committee shall maintain records of the meetings of the Recreation Resource Advisory Committee and make the records available for public inspection. (12) FEDERAL ADVISORY COMMITTEE ACT- A Recreation Resource Advisory Committee is subject to the provisions of the Federal Advisory Committee Act (5 U.S.C. App.). (1) NOTICE OF ENTRANCE FEES, STANDARD AMENITY RECREATION FEES, AND PASSES- The Secretary shall post clear notice of any entrance fee, standard amenity recreation fee, and available recreation passes at appropriate locations in each unit or area of a Federal land management agency where an entrance fee or a standard amenity recreation fee is charged. The Secretary shall include such notice in publications distributed at the unit or area. (2) NOTICE OF RECREATION FEE PROJECTS- To the extent practicable, the Secretary shall post clear notice of locations where work is performed using recreation fee or recreation pass revenues collected under this Act. (1) AVAILABILITY AND USE- The Secretaries shall establish, and may charge a fee for, an interagency national pass to be known as the `America the Beautiful–the National Parks and Federal Recreational Lands Pass’, which shall cover the entrance fee and standard amenity recreation fee for all Federal recreational lands and waters for which an entrance fee or a standard amenity recreation fee is charged. (2) IMAGE COMPETITION FOR RECREATION PASS- The Secretaries shall hold an annual competition to select the image to be used on the National Parks and Federal Recreational Lands Pass for a year. The competition shall be open to the public and used as a means to educate the American people about Federal recreational lands and waters. (3) NOTICE OF ESTABLISHMENT- The Secretaries shall publish a notice in the Federal Register when the National Parks and Federal Recreational Lands Pass is first established and available for purchase. (4) DURATION- The National Parks and Federal Recreational Lands Pass shall be valid for a period of 12 months from the date of the issuance of the recreation pass to a passholder, except in the case of the age and disability discounted passes issued under subsection (b). (5) PRICE- The Secretaries shall establish the price at which the National Parks and Federal Recreational Lands Pass will be sold to the public. (A) IN GENERAL- The Secretary shall sell the National Parks and Federal Recreational Lands Pass at all Federal recreational lands and waters at which an entrance fee or a standard amenity recreation fee is charged and at such other locations as the Secretaries consider appropriate and feasible. (B) USE OF VENDORS- The Secretary may enter into fee management agreements as provided in section 6. (C) MARKETING- The Secretaries shall take such actions as are appropriate to provide for the active marketing of the National Parks and Federal Recreational Lands Pass. (7) ADMINISTRATIVE GUIDELINES- The Secretaries shall issue guidelines on administration of the National Parks and Federal Recreational Lands Pass, which shall include agreement on price, the distribution of revenues between the Federal land management agencies, the sharing of costs, benefits provided, marketing and design, adequate documentation for age and disability discounts under subsection (b), and the issuance of that recreation pass to volunteers. The Secretaries shall take into consideration all relevant visitor and sales data available in establishing the guidelines. (8) DEVELOPMENT AND IMPLEMENTATION AGREEMENTS- The Secretaries may enter into cooperative agreements with governmental and nongovernmental entities for the development and implementation of the National Parks and Federal Recreational Lands Pass Program. (9) PROHIBITION ON OTHER NATIONAL RECREATION PASSES- The Secretary may not establish any national recreation pass, except as provided in this section. (1) AGE DISCOUNT- The Secretary shall make the National Parks and Federal Recreational Lands Pass available, at a cost of $10.00, to any United States citizen or person domiciled in the United States who is 62 years of age or older, if the citizen or person provides adequate proof of such age and such citizenship or residency. The National Parks and Federal Recreational Lands Pass made available under this subsection shall be valid for the lifetime of the pass holder. (2) DISABILITY DISCOUNT- The Secretary shall make the National Parks and Federal Recreational Lands Pass available, without charge, to any United States citizen or person domiciled in the United States who has been medically determined to be permanently disabled for purposes of section 7(20)(B)(i) of the Rehabilitation Act of 1973 (29 U.S.C. 705(20)(B)(i)), if the citizen or person provides adequate proof of the disability and such citizenship or residency. The National Parks and Federal Recreational Lands Pass made available under this subsection shall be valid for the lifetime of the passholder. (c) Site-Specific Agency Passes- The Secretary may establish and charge a fee for a site-specific pass that will cover the entrance fee or standard amenity recreation fee for particular Federal recreational lands and waters for a specified period not to exceed 12 months. (1) PASSES AUTHORIZED- The Secretary may establish and charge a fee for a regional multientity pass that will be accepted by one or more Federal land management agencies or by one or more governmental or nongovernmental entities for a specified period not to exceed 12 months. To include a Federal land management agency or governmental or nongovernmental entity over which the Secretary does not have jurisdiction, the Secretary shall obtain the consent of the head of such agency or entity. (2) REGIONAL MULTIENTITY PASS AGREEMENT- In order to establish a regional multientity pass under this subsection, the Secretary shall enter into a regional multientity pass agreement with all the participating agencies or entities on price, the distribution of revenues between participating agencies or entities, the sharing of costs, benefits provided, marketing and design, and the issuance of the pass to volunteers. The Secretary shall take into consideration all relevant visitor and sales data available when entering into this agreement. (e) Discounted or Free Admission Days or Use- The Secretary may provide for a discounted or free admission day or use of Federal recreational lands and waters. (1) EXISTING PASSPORTS- A passport issued under section 4 of the Land and Water Conservation Fund Act of 1965 (16 U.S.C. 460l-6a) or title VI of the National Parks Omnibus Management Act of 1998 (Public Law 105-391; 16 U.S.C. 5991-5995), such as the Golden Eagle Passport, the Golden Age Passport, the Golden Access Passport, and the National Parks Passport, that was valid on the day before the publication of the Federal Register notice required under subsection (a)(3) shall be valid in accordance with the terms agreed to at the time of issuance of the passport, to the extent practicable, and remain in effect until expired, lost, or stolen. (2) PERMITS- A permit issued under section 4 of the Land and Water Conservation Fund Act of 1965 that was valid on the day before the date of the enactment of this Act shall be valid and remain in effect until expired, revoked, or suspended. (1) With any governmental or nongovernmental entity, including those in a gateway community, for the purpose of obtaining fee collection and processing services, including visitor reservation services. (2) With any governmental or nongovernmental entity, including those in a gateway community, for the purpose of obtaining emergency medical services. (3) With any governmental entity, including those in a gateway community, to obtain law enforcement services. (b) Revenue Sharing- A State or legal subdivision of a State that enters into an agreement with the Secretary under subsection (a) may share in a percentage of the revenues collected at the site in accordance with that fee management agreement. (c) County Proposals- The Secretary shall consider any proposal submitted by a county to provide services described in subsection (a). If the Secretary decides not to enter into a fee management agreement with the county under subsection (a), the Secretary shall notify the county in writing of the decision, identifying the reasons for the decision. The fee management agreement may include cooperative site planning and management provisions. (a) Special Account- The Secretary of the Treasury shall establish a special account in the Treasury for each Federal land management agency. (2) remain available for expenditure, without further appropriation, until expended. (A) RETENTION OF REVENUES- Not less than 80 percent of the recreation fees and site-specific agency pass revenues collected at a specific unit or area of a Federal land management agency shall remain available for expenditure, without further appropriation, until expended at that unit or area. (B) REDUCTION- The Secretary may reduce the percentage allocation otherwise applicable under subparagraph (A) to a unit or area of a Federal land management agency, but not below 60 percent, for a fiscal year if the Secretary determines that the revenues collected at the unit or area exceed the reasonable needs of the unit or area for which expenditures may be made for that fiscal year. (2) AGENCY-WIDE DISTRIBUTION OF FUNDS- The balance of the recreation fees and site-specific agency pass revenues collected at a specific unit or area of a Federal land management and not distributed in accordance with paragraph (1) shall remain available to that Federal land management agency for expenditure on an agency-wide basis, without further appropriation, until expended. (3) OTHER AMOUNTS- Other amounts collected at other locations, including recreation fees collected by other entities or for a reservation service, shall remain available, without further appropriation, until expended in accordance with guidelines established by the Secretary. (d) Distribution of National Parks and Federal Recreational Lands Pass Revenues- Revenues collected from the sale of the National Parks and Federal Recreational Lands Pass shall be deposited in the special accounts established for the Federal land management agencies in accordance with the guidelines issued under section 5(a)(7). (e) Distribution of Regional Multientity Pass Revenues- Revenues collected from the sale of a regional multientity pass authorized under section 5(d) shall be deposited in each participating Federal land management agency’s special account in accordance with the terms of the region multientity pass agreement for the regional multientity pass. (F) a fee management agreement established under section 6(a) or a visitor reservation service. (b) Limitation on Use of Fees- The Secretary may not use any recreation fees for biological monitoring on Federal recreational lands and waters under the Endangered Species Act of 1973 for listed or candidate species. (c) Administration, Overhead, and Indirect Costs- The Secretary may use not more than an average of 15 percent of total revenues collected under this Act for administration, overhead, and indirect costs related to the recreation fee program by that Secretary. (2) a regional multientity pass authorized section 5(d) during the 5-year period beginning on the date the regional multientity pass agreement for that recreation pass takes effect. Not later than May 1, 2006, and every 3 years thereafter, the Secretary shall submit to Congress a report detailing the status of the recreation fee program conducted for Federal recreational lands and waters, including an evaluation of the recreation fee program, examples of projects that were funded using such fees, and future projects and programs for funding with fees, and containing any recommendations for changes in the overall fee system. The authority of the Secretary to carry out this Act shall terminate 10 years after the date of the enactment of this Act. (a) Authority to Use Volunteers- The Secretary may use volunteers, as appropriate, to collect recreation fees and sell recreation passes. (b) Waiver or Discount of Fees; Site-Specific Agency Pass- In exchange for volunteer services, the Secretary may waive or discount an entrance fee, standard amenity recreation fee, or an expanded amenity recreation fee that would otherwise apply to the volunteer or issue to the volunteer a site-specific agency pass authorized under section 5(c). (c) National Parks and Federal Recreational Lands Pass- In accordance with the guidelines issued under section 5(a)(7), the Secretaries may issue a National Parks and Federal Recreational Lands Pass to a volunteer in exchange for significant volunteer services performed by the volunteer. (d) Regional Multientity Passes- The Secretary may issue a regional multientity pass authorized under section 5(d) to a volunteer in exchange for significant volunteer services performed by the volunteer, if the regional multientity pass agreement under which the regional multientity pass was established provides for the issuance of the pass to volunteers. (a) Enforcement Authority- The Secretary concerned shall enforce payment of the recreation fees authorized by this Act. (b) Evidence of Nonpayment- If the display of proof of payment of a recreation fee, or the payment of a recreation fee within a certain time period is required, failure to display such proof as required or to pay the recreation fee within the time period specified shall constitute nonpayment. (c) Joint Liability- The registered owner and any occupant of a vehicle charged with a nonpayment violation involving the vehicle shall be jointly liable for penalties imposed under this section, unless the registered owner can show that the vehicle was used without the registered owner’s express or implied permission. (d) Limitation on Penalties- The failure to pay a recreation fee established under this Act shall be punishable as a Class A or Class B misdemeanor, except that in the case of a first offense of nonpayment, the fine imposed may not exceed $100, notwithstanding section 3571(e) of title 18, United States Code. (a) Land and Water Conservation Fund Act- Subsections (a), (b), (c), (d), (e), (f), (g), and (i) of section 4 of the Land and Water Conservation Fund Act of 1965 (16 U.S.C. 460l-6a et seq.) are repealed, except that the Secretary may continue to issue Golden Eagle Passports, Golden Age Passports, and Golden Access Passports under such section until the date the notice required by section 5(a)(3) is published in the Federal Register regarding the establishment of the National Parks and Federal Recreational Lands Pass. (b) Recreational Fee Demonstration Program- Section 315 of the Department of the Interior and Related Agencies Appropriations Act, 1996 (as contained in section 101(c) of Public Law 104-134; 16 U.S.C. 460l-6a), is repealed. (c) Admission Permits for Refuge Units- Section 201 of the Emergency Wetlands Resources Act of 1986 (16 U.S.C. 3911) is repealed. (1) Section 502 of the National Parks Omnibus Management Act of 1998 (Public Law 105-391; 16 U.S.C. 5982). (2) Title VI of the National Parks Omnibus Management Act of 1998 (Public Law 105-391; 16 U.S.C. 5991-5995). (1) LAND AND WATER CONSERVATION FUND SPECIAL ACCOUNTS- Amounts in the special accounts established under section 4(i)(1) of the Land and Water Conservation Fund Act of 1965 (16 U.S.C. 460l-6a(i)(1)) for Federal land management agencies that are unobligated on the date of the enactment of this Act shall be transferred to the appropriate special account established under section 7 and shall be available to the Secretary in accordance with this Act. A special account established under section 4(i)(1) of the Land and Water Conservation Fund Act of 1965 for a Federal agency that is not a Federal land management area, and the use of such special account, is not affected by the repeal of section 4 of the Land and Water Conservation Fund Act of 1965 by subsection (a) of this section. (2) NATIONAL PARKS PASSPORT- Any funds collected under title VI of the National Parks Omnibus Management Act of 1998 (Public Law 105-391; 16 U.S.C. 5991-5995) that are unobligated on the day before the publication of the Federal Register notice required under section 5(a)(3) shall be transferred to the special account of the National Park Service for use in accordance with this Act. The Secretary of the Interior may use amounts available in that special account to pay any outstanding administration, marketing, or close-out costs associated with the national parks passport. (3) RECREATIONAL FEE DEMONSTRATION PROGRAM- Any funds collected in accordance with section 315 of the Department of the Interior and Related Agencies Appropriations Act, 1996 (as contained in section 101(c) of Public Law 104-134; 16 U.S.C. 460l-6a), that are unobligated on the day before the date of the enactment of this Act shall be transferred to the appropriate special account and shall be available to the Secretary in accordance with this Act. (4) ADMISSION PERMITS FOR REFUGE UNITS- Any funds collected in accordance with section 201 of the Emergency Wetlands Resources Act of 1986 (16 U.S.C. 3911) that are available as provided in subsection (c)(A) of such section and are unobligated on the day before the date of the enactment of this Act shall be transferred to the special account of the United States Fish and Wildlife Service for use in accordance with this Act. (f) Effect of Regulations- A regulation or policy issued under a provision of law repealed by this section shall remain in effect to the extent such a regulation or policy is consistent with the provisions of this Act until the Secretary issues a regulation, guideline, or policy under this Act that supersedes the earlier regulation. (a) Federal and State Laws Unaffected- Nothing in this Act shall authorize Federal hunting or fishing licenses or fees or charges for commercial or other activities not related to recreation, affect any rights or authority of the States with respect to fish and wildlife, or repeal or modify any provision of law that permits States or political subdivisions of States to share in the revenues from Federal lands or, except as provided in subsection (b), any provision of law that provides that any fees or charges collected at particular Federal areas be used for or credited to specific purposes or special funds as authorized by that provision of law. (1) The sixth paragraph under the heading `FOREST SERVICE’ in the Act of May 23, 1908 (16 U.S.C. 500). (2) Section 13 of the Act of March 1, 1911 (16 U.S.C. 500; commonly known as the Weeks Act). (3) The fourteenth paragraph under the heading `FOREST SERVICE’ in the Act of March 4, 1913 (16 U.S.C. 501). (4) Section 33 of the Bankhead-Jones Farm Tenant Act (7 U.S.C. 1012). (5) Title II of the Act of August 8, 1937, and the Act of May 24, 1939 (43 U.S.C. 1181f et seq.). (6) Section 6 of the Act of June 14, 1926 (43 U.S.C. 869-4). (7) Chapter 69 of title 31, United States Code. (8) Section 401 of the Act of June 15, 1935 (16 U.S.C. 715s; commonly known as the Refuge Revenue Sharing Act). (9) The Secure Rural Schools and Community Self-Determination Act of 2000 (Public Law 106-393; 16 U.S.C. 500 note), except that the exception made for such Act by this subsection is unique and is not intended to be construed as precedent for amounts collected from the use of Federal lands under any other provision of law. (10) Section 2 of the Boulder Canyon Project Adjustment Act (43 U.S.C. 618a). (11) The Federal Water Project Recreation Act (16 U.S.C. 460l-12 et seq.). (12) The first section of the Act of June 17, 1902, as amended or supplemented (43 U.S.C. 391). (13) The Act of February 25, 1920 (30 U.S.C. 181 et seq. ; commonly known as the Mineral Leasing Act). (14) Section 4(e) of the Southern Nevada Public Land Management Act of 1998 (Public Law 105-263; 31 U.S.C. 6901 note). (15) Section 5(a) of the Lincoln County Land Act of 2000 (Public Law 106-298; 114 Stat. 1047). (16) Any other provision of law relating to revenue allocation. (c) Consideration of Other Funds Collected- Amounts collected under any other law may not be disbursed under this Act. (d) Sole Recreation Fee Authority- Recreation fees charged under this Act shall be in lieu of fees charged for the same purposes under any other provision of law. (e) Fees Charged by Third Parties- Notwithstanding any other provision of this Act, a third party may charge a fee for providing a good or service to a visitor of a unit or area of the Federal land management agencies in accordance with any other applicable law or regulation. (f) Migratory Bird Hunting Stamp Act- Revenues from the stamp established under the Act of March 16, 1934 (16 U.S.C. 718 et seq. ; commonly known as the Migratory Bird Hunting Stamp Act or Duck Stamp Act), shall not be covered by this Act. Notwithstanding any other provision of law, fees collected under the authorities of the Act may not be used for employee bonuses. 4 Responses to The real use of FS recreation access fees is exposed. I truly haven’t kept track of all the Forest and BLM efforts to incrementally privatize public lands by charging for recreational access, but I applaud those folks who do. There is a link at the Western Slope site linked to in the Scheider article Ralph has posted that has the Notes of an early January Forest Service meeting in DC that are well worth reading. The notes show the Forest chattering about planning to gut portions of NEPA, weaken the ESA, promote their “CEs” or Catergorical Exclusions for Forest Plans. AND (on page 16) they also show the Forest efforts to “reach in to” … “non-traditional corporations, environmental groups and partners, like the Tongass Forest Group. They looked at who’s on boards of directors and who’s making decisions”. on their ‘hazardous fuels’ tree cutting projects, elk collaboratives, etc. and give you access to some federal funds to pass through your organziation in so doing. This is all quite slick, amd explains in some ways the burgeoning “stakeholder” groups. On another note: While this is not an issue of the RAT fees (at least I don’t think it is), I have noticed new and just plain obscene high fee campgrounds going in on BLM lands. For example, the paved and hideously ugly new campground near Mackay Reservoir. Interestingly, in one of the versions of Simpson’s CIEDRA, the public land right next to this $16 or $20 a night DeLuxe BLM huge Motorhome (pro-Global Warming promoting, I guess)campground was to be privatized – to further limit regular folks from use of the area. I don’t know if it is in the version introduced this time … as last I heard maps haven’t been seen. Note, KT, is right about those notes. They have now been widely disseminated to conservation and outdoor groups. They are a “blockbusters showing the cynical planning of the current Administration and the agencies. A quick fellow-up to kt’s note. Whenever I hear the word “stakeholder,” I immediately think “co-opt.” Conservationists in Pennsylvania have seen this “stakeholder” crap in use for at least a decade. What use to be “public hearings,” where rablerousers would step up to a microphone to express a few points in front of their peers have evolved into “public meetings,” wherein the “stakeholders,” guided by a “facilitator,” go from display table to display table. There, they are handed little 3X5 cards on which they hand write down their “input” on the table’s topic-at-hand before moving on to the next table. The entire process is belittling. Yes, Alan that’s what I have observed, too, with the use of that awful term. The Forest or BLM calls you a Stakeholder when they hold a public meeting but don’t want to provide a public meeting-type forum to state concerns openly in front of others. They don’t want one citizen hearing another citizen say the agency proposal is a Bad Idea. They don’t want a meeting where the public forum dynamics of people speaking publicly sort of build on one another, and a Force of Opposition develops. And they certainly don’t want any reporter that might be present coming away with a sense that the public thinks their proposal is a bad idea. Far better to shuffle you around looking at posterboards and pretty pictures and filling in little postcard comments. The OTHER time when Joe Q. Public gets to be a “Stakeholder” is when he has committed be part of a collaborative group. THEN he becomes a special Stakeholder, to be held up as an example of “working together” above the regular public riffraff. Bottom line is: Once you get called a Stakeholder, they’ve figured out a way to keep you from making trouble. Plus, when you think about the sort of financial word play here; words like ‘stakeholder’ – sorta similar to ‘stock holder, and now we have a Tongass ‘Futures’ aka Quincy Library reborn in the North?